The term "grit" describes a sandpaper's abrasiveness, and sandpaper manufacturers use a number system to indicate sandpapers' relative roughness; smaller numbers are more abrasive than large numbers. The right grit for finishing spackling paste products depends on the weight, or thickness, of the spackling product and the fragility of the surfaces that surround the repair area. Spackling paste manufacturers typically specify appropriate sandpaper grits on product packaging. However, if manufacturers describe grit in vague terms, such as medium or light, a familiarity with sandpaper terminology helps you choose the right product for your project. Sanding blocks hold sandpaper taut throughout prolonged sanding projects. Standard spackling paste repairs generally call for a medium-grit sandpaper. Medium grits range from approximately 80 grit to 120 grit. However, lighter or heavier grits might apply to special spackling circumstances. Heavier grits, represented by numbers smaller than 80, strip and remove heavily damaged paint prior to repair. Lighter grits, represented by numbers larger than 120, offer the finest degree of smoothness. Painting conceals many visual inconsistencies. If you plan to paint your repair, you probably do not need to exceed 120-grit sandpaper. While a loose piece of sandpaper suffices for small spackling patches, sanding accessories reduce time and effort for large projects. Common accessories for spackling projects include hand sanders and block sanders. Partial sheets of sandpaper attach to the hand sander's and block sander's flat base plates, usually by a clamping mechanism. The base plate's clamp keeps the sandpaper taut as workers use the tool's handles to evenly draw the paper across the dried spackling paste. Drywall professionals use the wet sanding technique to reduce dust exposure and mess during drywall finishing operations. Like drywall joint compound, spackling paste is water soluble, and you can apply wet sanding techniques to standard spackling repairs. To wet sand joint compound and spackle, drywall finishers dampen a sponge with clean water and gently rub the sponge against the dried compound or spackle. Like sandpaper, the moist sponge smooths the compound's surface. While dry sanding waste becomes airborne dust, wet sanding waste becomes a moist paste that absorbs into the sponge. Although nearly any household sponge is suitable for wet sanding, specialized drywall sponges are designed to hold up against rough wall surfaces. Dry sanding spackling paste and drywall joint compound produces irritating and potentially harmful dust. 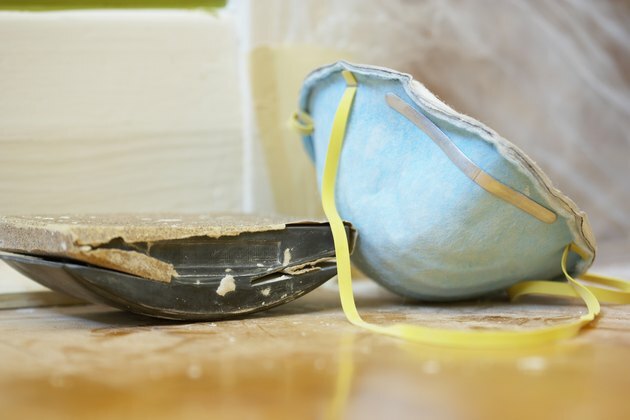 To avoid dangerous levels of exposure to dust, workers should wear skin, eye and respiratory protection while dry sanding. Skin protection includes gloves and long-sleeved clothing. To fully protect eyes, workers should wear goggles that fully depress against the face. Most importantly, approved respirators prevent inhalation of potentially harmful dust particles.